Can ecosystems be engineered or are they by default out of control of individuals? Can companies be founded on the explicit intent to nurture ecosystems of value creation? How do you counter disruption and turn it into a force for company growth rather than a ticking time-bomb of eventual corporate demise? I very deliberately use the word trademark instead of brand, because a company can own its trademark (logo), but a brand is something that only comes a live in the hearts and minds of consumers and thus cannot be ‘owned’ in the traditional sense. The unavoidable question then becomes whether communities and ecosystems are the unavoidable side-effect of the rise of the connected and empowered consumer I wrote about in an earlier post, or something than companies can deliberately engineer through careful strategies? The work of a dear colleague and friend at the LEGO Group, Tormod Askildsen, Head of Community Engagement and Events (CEE) would suggest this is indeed the case. Some publications he has collaborated on shed a deeper light, such as this one from the MIT Sloan Management Review and this seminal book Groundswell: Winning in a World Transformed by Social Technologies. While much has been written about communities and co-creation, this recent book by Yves Morieux, offers a fresh perspective of the key principles that govern value creation. The book was originally intended to address the growing complexity in companies by describing the principles needed to re-engineer companies to be more like adaptive networks and communities than the rigid inflexible structures that breed silo-ed decision-making, sub optimisation and disillusioned employees. Reading this, it struck me that the principles outlined in the book are equally valid when analysing what governs communities and ecosystems that create value around brands. In fact, I argue that these principles can be used proactively to grow ecosystems for value creation. Below is a TED talk by Morieux that summarises his 6 Simple Rules effectively. Whenever he talks about companies, just think communities. Outside the company what are the jobs that people enlist your product to do? Theodore Levitt, from Harvard pioneered this way of thinking, famously stating that people don’t buy a drill, but instead a quarter inch hole. Clayton Christensen since expanded a lot on the jobs to be done framework, and argued that simply understanding what people need isn’t enough. Especially not, by segmenting users based on their age, gender, location, job etc. By making the unit of analysis the jobs to be done, he argued that it would help us define products and services much better. I would like to take it further to argue that the jobs to be done also change with the level of affinity consumers have for a company. When looking at products such as milkshakes and fast food, the affinity that consumers have for a brand may be low and thus jobs to be done is a highly relevant way to look at solutions. 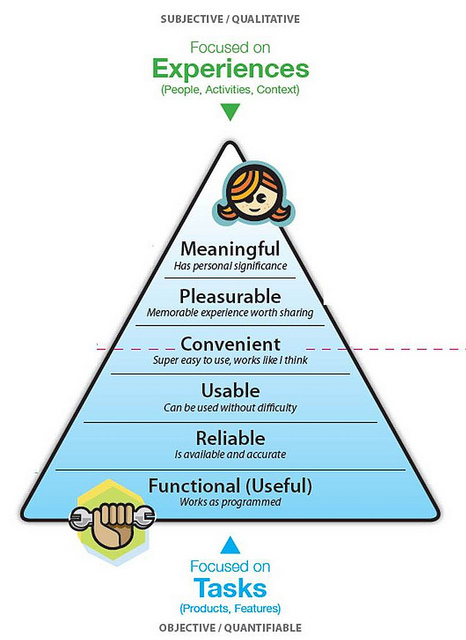 Stephen P. Anderson ‘s UX Hierarchy of Needs (below) shows the progression where at the bottom of the pyramid the jobs to be done are a useful way to understand the purpose for which products are enlisted, and the emphasis is on objective and quantifiable outcomes. Moving up the pyramid, the objective, quantifiable outcomes do not disappear, but are further supplemented by increasingly subjective and qualitative requirements. Moving higher in this pyramid, affinity for the brand also grows, and users higher in the pyramid are more likely to contribute value to the community and ecosystem beyond simply consuming, additionally are more likely to engage in positive word of mouth, buy more, more frequently and help innovate around the product or brand. Understanding what people do is thus as much understanding the jobs to be done, as it is understanding the emotional aspects involved and finding ways to support both. Recognise and appreciate the community – give them a platform, celebrate their work, empower them to use their judgement and contribute to the community as a whole. In the company connect parts of the company to the community, create win-win situations where the company can find ways of meetings its goal through a strong collaboration with the community. As Yves Morieux says – you must give more cards to people so that they have the critical mass of cards to take the risk to cooperate, to move out of insulation. Otherwise they will withdraw. In both cases, think about what you can do to give people the power and interest to make others cooperate. For our LEGO fans we have Certified professionals, a program for those who have made LEGO creations their professional career, and an Ambassador program where annually the community vote for their representatives, who help bring the voice of the community to us, as well as connect users in the community to user groups. The LEGO Community team are integrators in turn between the fans and the company. Remove the buffers that make us self-sufficient. As Morieux puts it ‘When you remove these buffers, you hold me by the nose I hold you by the ears. We will cooperate.’ The example he gives is families arguing what TV program to watch. Instead of agreeing, the family buys another TV. This ‘self-suffiency’ removes reasons to co-operate. Remove the second TV says Morieux. Identify the barriers that prevent reciprocity, often it is easier to do things yourself than collaborate with others to make it happen, yet often greater value can be created, on a larger scale, through collaboration. Therefore, proactively engineer reasons for reciprocity. Create feedback loops that expose people to the consequences of their actions. Air BnB have used this to help us get around the biggest issue of all, welcoming strangers into your own home, typically when you are not even there. This idea is entirely counter intuitive to everything we have grown up to believe about our most intimate space, our home, and strangers. Yet, by extending the shadow of the future: Air BnB hosts rate their guests and vice versa, positive behaviour dominates and new value can be created for hosts in realising value of their unused space, for guests in finding welcoming spaces to stay and Air BnB for matchmaking between the two. In earnest, Air BnB of course didn’t pioneer the power of ratings, but has surely proven that applying the power of the shadow of the future can be powerful enough to encourage positive behaviour even in circumstances most deserving of our mistrust and doubt, thereby opening up the opportunity of value creation for all. You need to reward those who cooperate and blame those who don’t cooperate. Jørgen Vig Knudstorp, our CEO at the LEGO Group, says that blame is not for failure, it is for failing to help or ask for help. And as Morieux puts it, It changes everything. Suddenly it becomes my interest to be transparent on my real weaknesses, because I know I will not be blamed if I fail, but if I fail to help or ask for help. This approach also creates another reinforcing mechanism for an ecosystem and how we align ourselves with an active community. We must earn our place at the table with our consumers, we can only do that by empowering employees to be in those conversations, to have an interest in learning about the needs about the consumers and making everyone accountable for supporting the ecosystem – also the community. There are great examples of the above, not just by the LEGO Group but also by many others. We have had some great experiences working with the LEGO community on LEGO Mindstorms, the countless fantastic ideas contributed on the LEGO Ideas platform are another example, LEGO Architecture is yet another example of fan innovation. I would argue that any company, like Air BnB, who leverages their community as part of value creation is already using the above rules to create growth. The above though, makes it possible to do so proactively and design shared value creation in from the beginning, rather than let it become the disruptive force and death knell in the future.